Cold forged pins to 1 1/8" (28.6mm) dia for consistent grain flow, maximum strength and superior surface finish. JUST DETERMINE IMPLEMENT HOLE DIA. Only BARE-Co have invested in special thin wall nuts, to provide clearance for straight shank design on plough cross shafts etc. 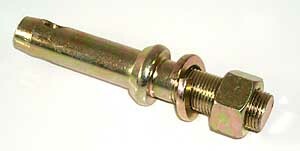 CAT 1 (22mm) Pin dia.